Is Lutz, 77, the right guy to steer GM marketing? DETROIT -- Hes got the guts: Hes a blunt-speaking attack-jet aviator who gets his jollies flying fighters at age 77. Hes got the name: Hes an acknowledged automotive-industry star and a design ace. And hes got the experience: Hes worked in the industry for 46 years. But the question being bandied about in advertising circles is whether that vast experience could work against Bob Lutz in an age in which selling cars is increasingly about amplifying peer-to-peer recommendations and data-driven direct marketing and less about the mass-market commercials that have long been the mainstay of most General Motors brands. True, the dramatic comeback of the vice chairman -- who was slated to retire at the end of the year before being named last week to run marketing at the countrys fourth-largest advertiser -- gives GM a much-needed name to put in front of a skeptical public. But is he up to the challenge of being, as GM CEO Fritz Henderson called him, a change agent? The unflappable Lutz, who until April headed global product development, is taking on the added responsibility of advertising and marketing czar. Its a far-reaching role. Bobs responsibilities beyond creative design will include brands, marketing, advertising and communications, and his job is to integrate those activities and provide accountability for consistent messaging and results, Henderson said after unretiring Lutz. Some believe GM needs more of an up-and-coming, digital-savvy CMO than an established Mr. Fix-It. They said new blood is needed to signal that its not business as usual at the new GM, which the appointment of Lutz seems to indicate. GM has to do something radical in communications, one of them said. Indeed, one of Lutzs first tasks was to call meetings next week with officials of GMs remaining four vehicle brands to see proposed ad work and to get him up to speed on some of the most current messaging. But there wasnt mention of overall marketing strategy, new media or media planning. And while GM spent $2.9 billion last year, $669 million of the total was spent in unmeasured media, which is a swiftly growing part of the business for automakers and marketers at large. Arthur Bud Liebler, former senior vice president of marketing at Chrysler who also worked with Lutz there, said his former boss has a good understanding of marketing. Liebler, who now runs an eponymous communications-strategy firm, recalled Lutz being outspoken after being shown a proposal for an emotional and sensual ad campaign for the Dodge Ram pickup in the mid-90s. Lutz called the work pretty advertising, then asked why the managers behind it werent telling consumers about the changes in the truck. We changed that campaign in a hurry, Liebler said. Thats undebatable. Lutz began his automotive career in 1963 at GM in Europe before joining BMW in Munich as executive vice president of sales for three years. Lutz spent 12 years at Ford Motor Co. and served on its board. He logged a dozen years at Chrysler, where he led all auto activities, including marketing and product development, and he chronicled his time there in his 1998 book, Guts: The Seven Laws of Business That Made Chrysler the Worlds Hottest Car Company. He rejoined GM in 2001. 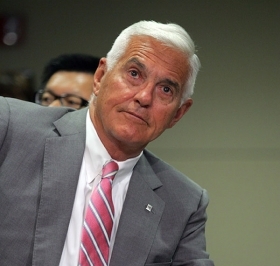 Therell be those wholl say a guy whos been selling cars for 46 years is going to have trouble changing the way its done, but the consensus from those who know him is that if any 77-year-old can rip up the rulebook, its Bob Lutz.